You'll be £12.00 closer to your next £10.00 credit when you purchase ShipCraft 16: Admiral Hipper Class Cruisers. What's this? Order within the next 2 hours, 18 minutes to get your order processed the next working day! The 'ShipCraft' series provides in-depth information about building and modifying model kits of famous warship types. Lavishly illustrated, each book takes the modeller through a brief history of the subject class, highlighting differences between sister-ships and changes in their appearance over their careers. This includes paint schemes and camouflage, featuring colour profiles and highly detailed line drawings and scale plans. The modelling section reviews the strengths and weaknesses of available kits, lists commercial accessory sets for super-detailing of the ships, and provides hints on modifying and improving the basic kit. This is followed by an extensive photographic survey of selected high-quality models in a variety of scales, and the book concludes with a section on research references - books, monographs, large-scale plans and websites. STEVE BACKER is the editor of steelnavy.com, the best warship modelling site on the web, for which he writes extensively on warship kits and accessories. He is also the author of four previous titles, Japanese Heavy Cruisers, British Battlecruisers, Essex Class Carriers and Bismarck and Tirpitz in this ShipCraft series. A book for Seaforth Maritime’s Ships Craft series for modellers, this is a lot more than that purpose would suggest. As well as a number of good clear pictures of well-made models of the “Hipper” and her sisters, the book provides a very good and well-illustrated history of the class. Proud, purposeful and potent, the five Hipper class heavy cruisers were among the world’s most impressive and heavily armed when constructed at the start of World War Two. Of the five, only ‘Admiral Hipper’, ‘Blucher’ and ‘Prinz Eugen’ were finally completed. Due to indecision and fateful decision making on the part of the German high command only the ‘Hipper’ did any real damage to Allied ships. Her magnificent sisters were largely wasted. Nevertheless they provide an excellent subject for modellers. This book is the latest in the Classic Warships series, and aims to provide modellers with all they need to know about a famous class of warships and associated model kits. It is devoted to the German Admiral Hipper class, among the largest heavy cruisers ever built. Within this issue, readers will read about the design, history and careers of these famous cruisers. With its unparalleled level of visual information - paint schemes, models, line drawings and photographs in colour and black and white, it is generally acknowledged as the best reference for any model maker setting out to build a model of one of these famous cruisers. THIS book is the latest in the Classic Warships series, and aims to provide modellers with all they need to know about a famous class of warships and associated model kits. It is devoted to the German Admiral Hipper class, among the largest heavy cruisers ever built. Of the three completed ships, Blucher was sunk early in the war, during the invasion of Norway, but both Admiral Hipper and Prince Eugen were involved in many famous actions and served until the last days of the conflict. Brief coverage is extended to two uncompleted ships, Seydlitz and Lutzow. Within this issue of Shipcraft, readers will read about the design, history and careers of these famous cruisers. Model products are introduced, showing all the different types of models that can be collected, including someone's showcase of their own model. Colour schemes are introduced with different features of the cruisers, making it an exceptional read for anyone interested in ship modelling and a fine addition to the Shipcraft series. With its unparalleled level of visual information - paint schemes, models, line drawings and photographs in colour and black and white, it is generally acknowledged as the best reference for any model maker setting out to build a model of one of these famous cruisers. 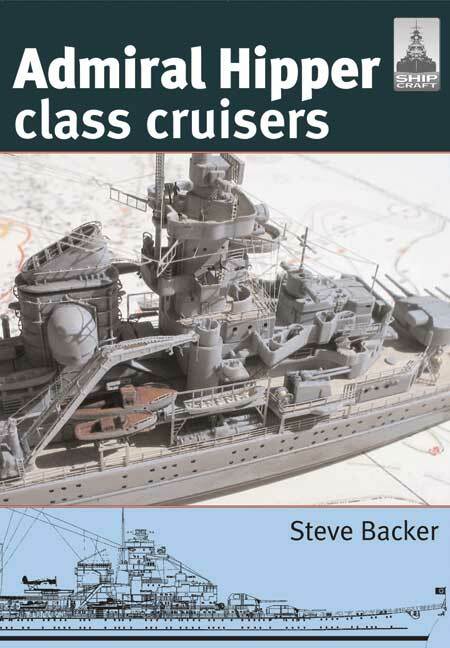 STEVE BACKER is the editor of the respected SteelNavy web site for ship modellers and the author of two other titles, Japanese Heavy Cruisers and Bismarck and Tirpitz, in this ShipCraft series.